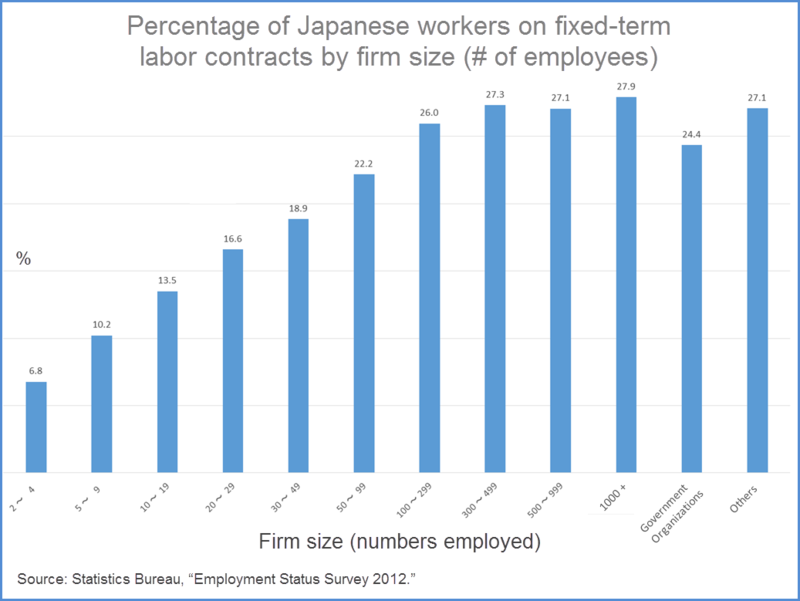 As lifetime employment ceases, Japanese firms are less willing to train employees. Employers seek to hire the already skilled, replacing permanent staff with project workers on short-term contracts in jobs that provide fewer on-the-job training opportunities. Professor Yuji Genda, a labor economist at the University of Tokyo’s Institute of Social Science, asks who will train Japan’s future workforce? Painting a nuanced picture of Japan’s labor market, Genda notes that not all nonregular workers hold low-paid manual jobs. Some are well-trained individuals who prefer project work over full-time employment. Others take part-time jobs so they can care for babies or elderly parents. Some nonregular jobs offer advancement opportunities. Others do not. In the worst cases, the jobs lead nowhere. “It’s a diverse group” whose job stability varies by each situation, he says. Among those in nonregular jobs are temporary full-time workers and permanent part-time workers. Loft workers are an example of part-time employees with stable jobs. Named after the well-known Japanese chain store, Loft workers are highly trained individuals with deep knowledge about the retailer’s wide product range. Because their skills are scarce, they can work until retirement. “Loft workers are not regular workers, but they can work as long as they like,” says Genda. “They don’t necessarily earn much money, but they have a chance to work and develop their careers,” he adds. Other nonregular workers have the ability to earn large amounts based on performance. Among them are highly skilled contract workers. Some are better trained to perform specialized tasks than those in permanent employment. The underlying trend, however, is a shift from organizational work to project work. The shift is driven by the need to hire more flexible labor, as companies confront increased global competition. It also arises from a growing number of skilled workers seeking economic independence through self employment. During the postwar period, capital invested in factories lifted livelihoods of large numbers of people. In the post-industrial age, experts now worry that software and robotics will hollow out the middle classes. They believe platforms like Uber and Airbnb deny workers healthcare, pensions, and other standard company benefits, giving rise to ‘precariat’ — a class of low-paid contract workers. Others (like Daniel Pink, author of Free Agent Nation) argue that new technologies allow more people to seek personal fulfillment through entrepreneurship. Nobody knows which group will gain or lose the most. It is males, however, who are forced into the nonregular workforce in overwhelming numbers in Japan — a domain formerly occupied mainly by women. Big Japanese firms once satisfied their need for reliable staff by offering secure jobs to mostly male graduates. Then, men came to form Japan’s primary labor force of seishain (regular employees). Women were relegated to an underclass of lower paid and disposable hiseishain (nonregular employees). As lifetime employment ends, men are entering the secondary labor market in large numbers for the first time. Literally translated as ‘right employee’ and ‘wrong employee’, the two classifications are cultural and sociological adaptations that are ultimately discriminatory, thinks Genda. “Who is a ‘right employee’? Who is a ‘wrong employee’? he asks. Nobody can answer those questions because clear legal definitions for the classifications do not exist under Japanese law. The terms simply describe what these employees are called in the workplace. Genda says there is insufficient data about Japan’s evolving labor market on which to make useful policy decisions. The government does not ask companies or employees to record or report details of employment contracts. So nobody knows if Japan’s labor market is splitting into a small number of working elites with high paying full-time jobs and an expanding underclass of poorly paid workers who lack prospects of ever getting a regular job — although Genda doubts the validity of such reports. Nor does he believe that 40% of all workers are nonregular. “Japanese economists and researchers do not understand the labor situation,” he regretfully sighs. What is known is that over one-quarter of those who work at Japan’s big employers are nonregular workers. They think about getting second jobs. “Even in large companies, nobody believes their jobs are safe,” says Genda, confirming his belief that lifetime employment exists today only in myth. Smaller firms, on the other hand, offer many more full-time jobs percentagewise. They need to in order to attract top talent who would otherwise prefer to work at larger and more prestigious companies (see chart). Genda challenges his students, many who still want to work at large firms (even on a project basis) by asking them, “Why don’t you work for a small sized firm?” He says the time for choosing is now, as opportunities for the next generation to gain vocational skills slowly shrivel. Japan’s once enviable skills development programs are disappearing along with lifetime employment. Many workers don’t have time or money to self-train. The government has not the budget or the capacity to assist. Without a solution, the nation is at risk of entering into a skills depletion vicious circle. “How can we create needed skills formation?” asks Genda. Nobody yet has a clear answer.